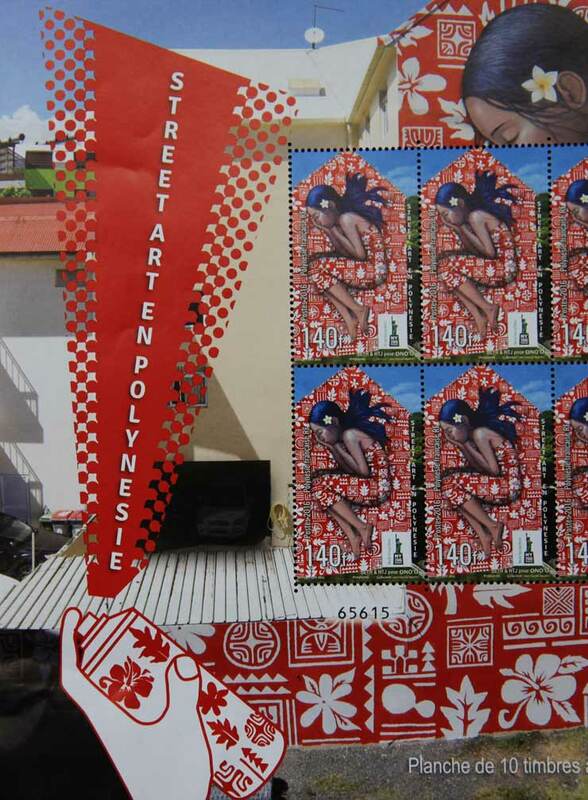 A new postal stamp in French Polynesia highlights a mural at the “ONO’U” festival in Tahiti, a first for the multi-island country as well as the French Street Artist SETH and his local Tahitian collaborator, HTJ. 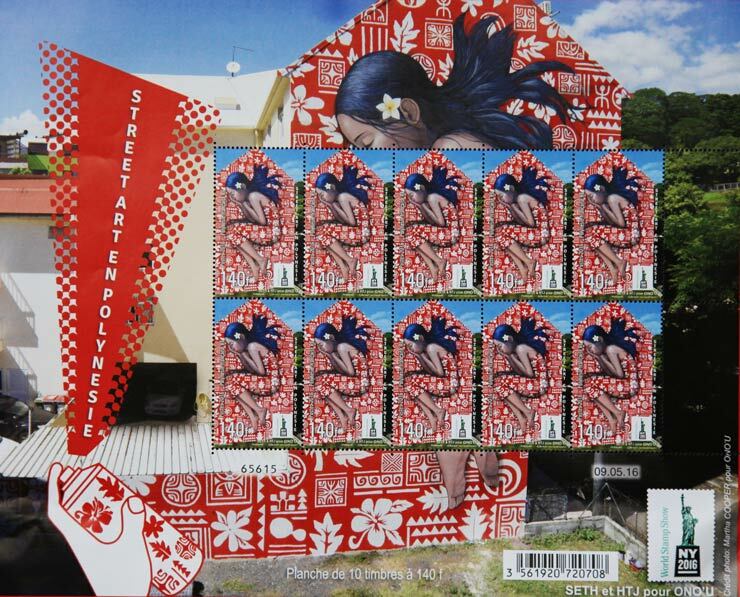 Introduced in New York last week at the decennial World Stamp Show, an eight-day stamp extravaganza visited by a quarter million people, the new 140 CFP stamp depicts his mural at the 2015 “ONO’U” festival, as shot by photographer Martha Cooper. Looking at the patterns in the bedspread you may also see more than the folklore forms of typical plant leaves and the Tiaré flower that many wear tucked behind an ear in archetypical portraits however. You also may recognize a symbol for radiation near the girls back and the form of a an atomic mushroom cloud near her bended knees, both referencing the approximately 175 nuclear tests that France did on the island of Moruroa from roughly 1966 to 1996, tests which The Gaurdian now says ‘showered vast area(s) of Polynesia with radioactivity‘. By inclusion of these symbols with more traditional symbols in the new piece one is reminded of the inclusion of historical disasters traditionally in folk art ranging from pottery to quilting. Since we began making art we have been storytelling about natural disasters, man-made disasters, wars, political upheavals, societal shifts, milestone events and religious practices. 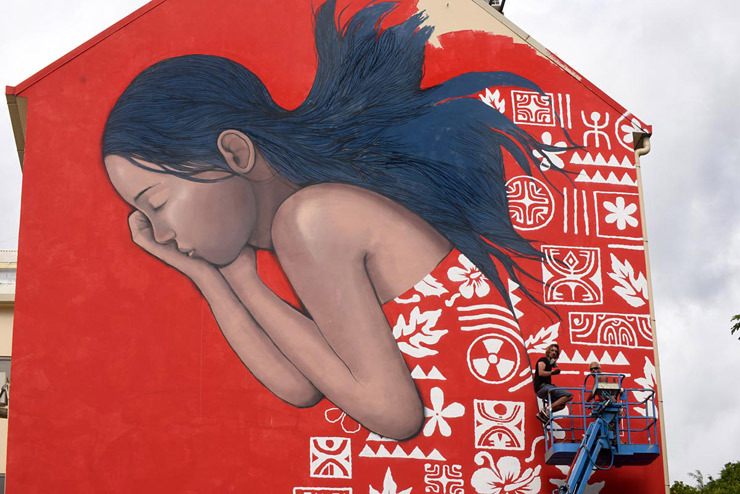 As Street Art influenced murals have gained a wider audience across the world and certain works and artists are highly celebrated, there have been other issues of official stamps in recent years including works from Invader, Shepard Fairey, C215, Rero, Vhils, Ludo, and Mis Tic. 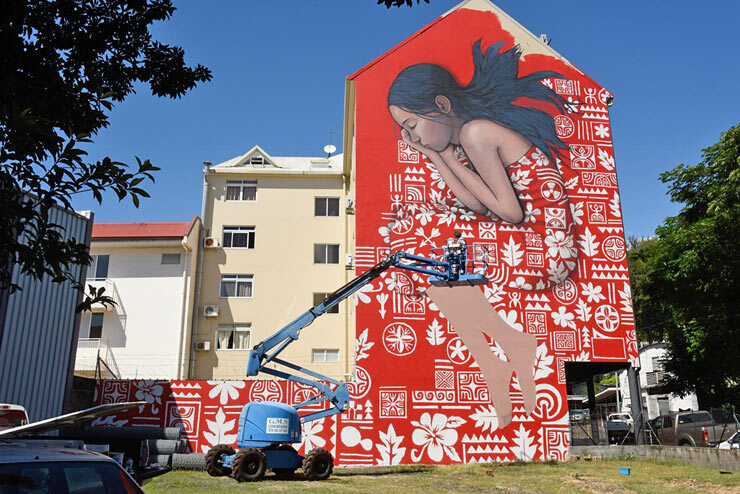 The presidents of France and Singapore released a dual “Street Art” stamp a year ago and a recent Polish stamp depicts a 4 story wall by Polish painter Natalia Rak in Białystok, Poland of a young girl in traditional Polish dress who is watering a tree. The “ONO’U” festival is now readying for its third edition and Ms. Roopinia was in New York with Mr. Ozonder to check out the current Street Art scene, the Coney Art Walls, the Governors Ball concerts and to share their new stamp with the thousands of people trekking by at the stamp exhibition. 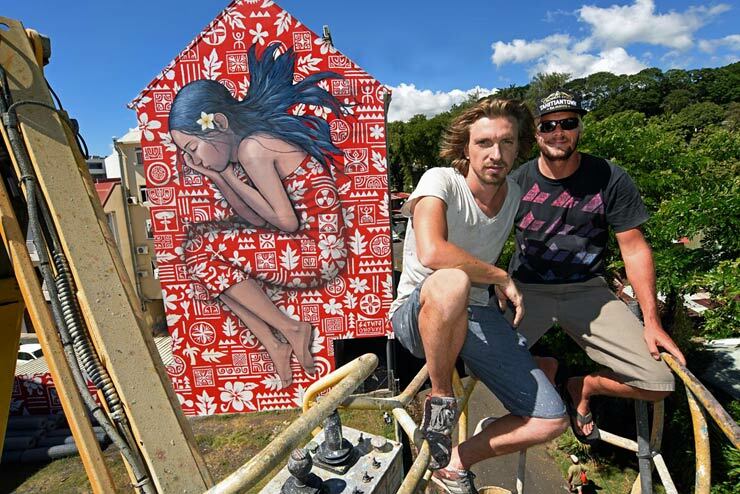 Roopinia tells us that the hugely successful festival draws top names for exhibition and competition from both the Street Art and graffiti world, but initially the mayor of Papeete, landlords, and the local businesses were rather hesitant, as were Street Artists who had not considered going to a place where there was not a large graffiti or Street Art scene to speak of. 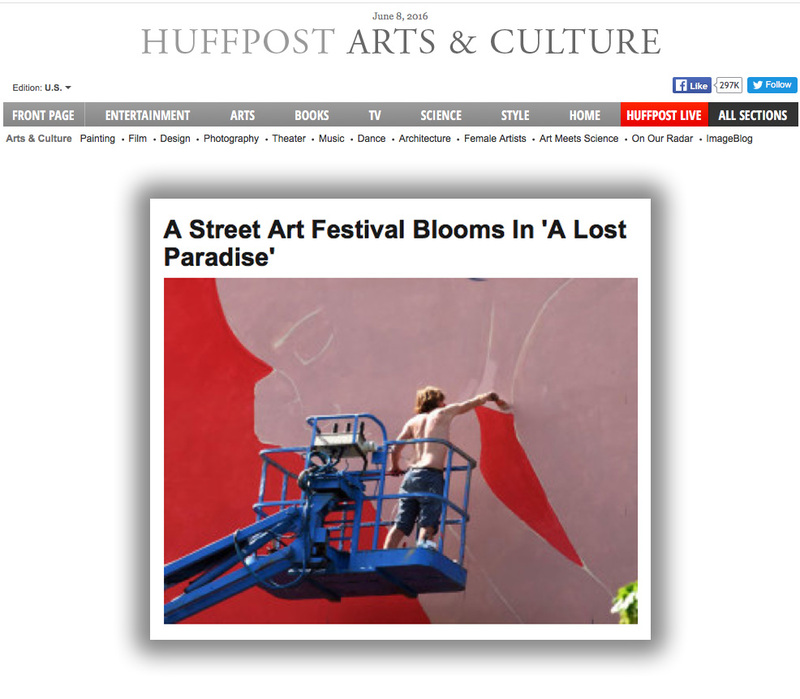 “The challenge that we had was convincing the best street artists in the world to come to a ‘lost paradise’ to paint gigantic walls right in the center of the city. For a whole year we were working on finding walls, convincing the owners. Basically for the first six months no one was willing to give us their walls because they thought that it was all going to be horrible – so convincing the population was difficult,” she says. “I could feel that some of the politicians were not very happy that we were going to do this in the beginning because they didn’t understand exactly that a small team could do such great things with artists,” she says, but the response of locals and businesses was overwhelmingly good, and word of the festival spread among artists, not least because most of their costs are covered and, by the way, they are painting in Tahiti after all. And quite a substantial budget it is. The partners say they have to raise over €300,000 a year and “80% of the festival is funded by private partners and sponsors,” including brand names like Nissan, Perrier, and Montana paints. The remaining 20% is funded by the city and the Ministry of Tourism. 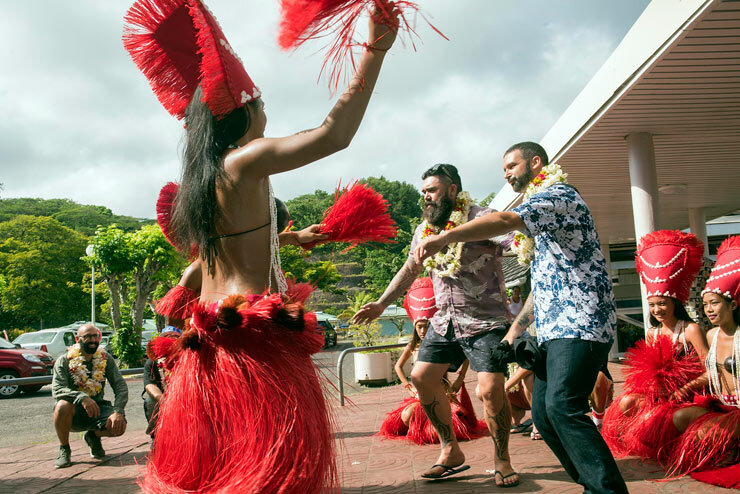 Click HERE to learn more about ONO’U Tahiti Festival. 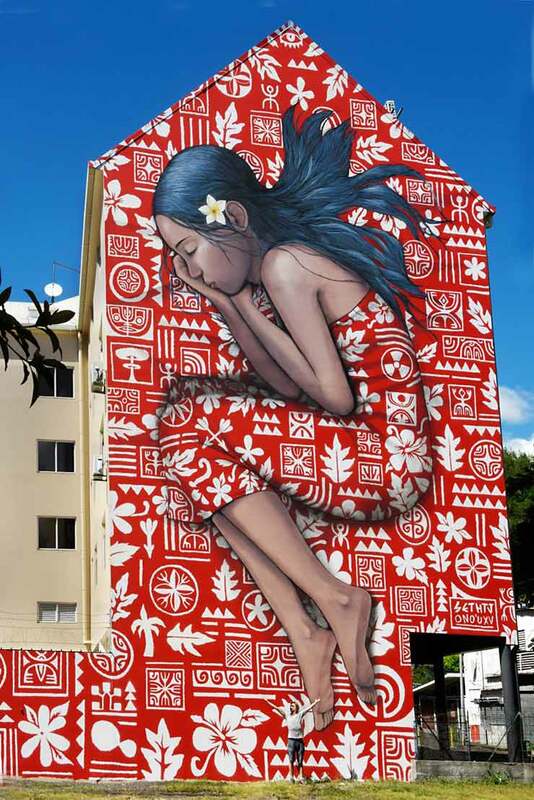 Graffiti and Street Art. Tahiti, French Polynesia. Our very special thanks to photographer Martha Cooper for sharing her photos with BSA readers.